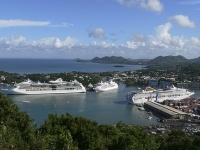 St Lucia's capital Castries owes much of its existence to the many cruise ships that dock in its deep water port. The town is attractive enough, but apart from shopping has little to offer visitors. St Lucia's real charms are revealed in day trips away from Castries, into the glorious hinterland and along the scenic coastline. The local people are famously friendly and the weather perpetually sunny. Cruise ships docks at quays on both the north and south sides of the harbour. The two sides are linked by water taxis. The north side is called La Place Carenage and is closest to Castries. Passengers exit through a duty-free shopping centre into Castries old town. The south quay is closer to a larger duty-free shopping centre at Pointe Seraphine across the water. Old Castries is easily accessible by foot from the disembarkation areas. Buses with green license plates leave from Castries to all parts of the island. Taxis, with blue plates, are also a good option, and recommended over car rental as the roads can be dangerous for drivers unused to local conditions. Take a helicopter ride for a scenic view of the whole island. Check out the Diamond Botanical Gardens with its impressive waterfall and the bubbling sulphur springs of Soufriere volcano. Visit the enormous banana plantation of Marquis Estate, climb Morne Fortune, for photo opportunities, and stop by Marigot Bay, one of the most picturesque bays in the Caribbean. The local beaches are fabulous too; Malabar Beach, Choc Beach, and La Toc Beach are close to Castries. Visit the old market at the corner of Jeremie and Peynier streets for indigenous crafts and colourful scenes from local life. Look out for wood carvings, spices, and banana ketchups. Two substantial duty-free shopping centres are at La Place Carenage Pointe Seraphine, although the goods are fairly uninspiring and aimed squarely at tourists. Eudovic studios in Goodlands sells unique and finely crafted wood carvings.